We left Volume 1 when Karin bit Kenta's mother, which Kenta just happened to witness. Kenta still has no idea what Karin did to his mother, but he knows that she's different. Better, in fact. She's never been so cheerful or had so much energy. Kenta is in the odd position of liking his mother's new attitude and also wishing she was acting normally. Meanwhile, Karin is still drawn to Kenta's blood. And since she is most drawn to people who are unhappy, she figures that the best way to keep from biting Kenta is to make his life as joyous as possible. So she's super nice to him, offers him her lunch, etc. But still they keep having awkward collisions where Kenta witnesses Karin's vampiric oddities. The highlight of this volume - and I imagine this series - is Anju, Karin's little sister. She is a stereotypical goth at 11 years old. Even though she is younger than Karin and hasn't grown into her vampire powers, she always gets her sister out of scrapes. She is always drawn as thin, dark, and serious, and always carrying one of her creepy talking dolls. This is such a weird series. It is just interesting enough to keep me wanting more. It's not really a "cool" weird, but rather an "urgh...what was that?" weird. At times it is cheesy and at other times it's rather creepy (there's a high school prostitution subplot line). I don't know if I'd recommend it, but since I've started it, I want to keep going for at least a little while. I remember reading this series years ago. It was silly, but entertaining to me. I didn't take it too seriously though. As you said, some of subplots are very odd. 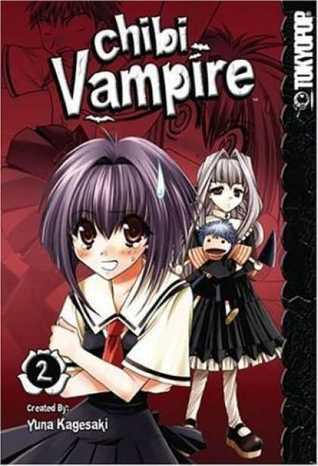 I've heard good things about Chibi Vampire, but I've never read it. I'm really picky about manga, because once I start a series, if I like it, I HAVE to own the whole series. I'm still trying to get all of Rurouni Kenshin, Buso Renkin, and Claymore. I was curious as to when the vampire power/oddities kick in. Is it during puberty? Anju does sound like an interesting character. I wonder if she'll become more of a main character as the series goes on. "It's not really a "cool" weird, but rather an "urgh...what was that?" weird." Manga is just weird. But yeah... I see what you're saying about this one. It is pretty out there. I read this series a couple of years ago. I really enjoyed it. I thought it was quirky and fun. Karin's affliction was definitely something I've never encountered in vampire stories. The series really picks up when Karin's grandmother enters the pictures. She stirs up trouble and is quite funny.